There is a notebook called Moleskine Evernote Notebook and it is available for purchase on Amazon and moleskine.com. This notebook is unique in the sense, that when you buy this notebook it comes up with certain stickers. There is an envelope type pocket in the notebook where you can find these stickers. These stickers are called smart stickers, as they are very useful to organize and tag your written notes in digital format. In order to understand how stickers can be useful, first we need to know about an app called Evernote. This Evernote app can be easily downloaded on your smartphone device. Free version of this app has limited features, while the paid version allow you to use its advanced features. Evernote can also be used, as a web based application on your desktop, or laptop, by signing up and opening a free account at evernote.com. However the features are still limited for free accounts on the web based application as well. The main purpose of the Evernote app or program is to create, write, name, edit, save and organize the different notes in different digital notebooks, and these digital notebooks can be easily created inside the Evernote app. Evernote is actually a library of digital notebooks. Suppose you are a science student, and you write notes on different subjects like Biology, Physics, Maths, Chemistry etc. Then by using the Evernote you can create different digital notebooks by different names like Biology, Physics, Maths, Chemistry etc. Once you have created the digital notebook, and given the name to each notebook, just click that notebook icon to write whatever you want to write in the screen editor (different formatting options are available), and save your notes with different tags. Under a specific notebook (say biology) different tags can be assigned to different topics (in biology), under that same notebook, and those tags are searchable using the search box in the Evernote app, for quick access. Evernote will automatically organize the complete list of notebooks, and different tags under them, in the front screen for easy access. Now coming back to the Moleskine Evernote Notebook (as mentioned in first paragraph), all the hand written notes in this physical Notebook, can be digitized in an organized way in the Evernote app in your smartphone. For that, the smart sticker should be pasted near the text of any note you are writing in the physical notebook (not digital notebook). Evernote app has the ability to recognize all the stickers supplied along with the Moleskine Evernote Notebook, and other stickers won't work. There are total 6 different types of smart stickers provided with the each physical notebook you buy. Each sticker has one default tag associated with it. Lot of such repeated stickers come along with the purchase (of notebook) and 6 are only different types. By default, six different tags associated with 6 different stickers are Home, Action, Rejected, Approved, Travel and Work with relevant pictures on the stickers associated with these themes. The pictures of these stickers you can see by going to official website help.evernote.com. Here is also a nice video to know how stickers work for organizing the notes. If you paste any one sticker (say Home sticker) on a particular note (you wrote in the physical notebook), and than take a snapshot of this note, using the camera in your Evernote app, than this note (by default) will be automatically saved in the Home Tag, in the default digital notebook of the Evernote app. So this is where the usefulness of the stickers come in, and this is only possible with Moleskine Evernote Notebook. But, as I said earlier, different notebooks by different names can be created in the Evernote app or Evernote web based program. So accordingly any tag associated with a particular sticker can be customized. For example, if you have written a note (in physical Moleskine Evernote Notebook) based on some topic of biology, and you want this note to be digitally saved in the Evernote app, in the biology digital notebook, (however you first need to create biology digital notebook in app) than this can be easily done, by customizing the tag (in the app) associated with the sticker you pasted on that particular biology based written note. Suppose you pasted the home sticker on the biology note, than simply go to settings section in the Evernote app, and make all notes associated with the home stickers to be saved and organized (serial wise) in the biology digital notebook in the Evernote. Now every time you write any biology based note simply paste home sticker to it and take a snapshot and save, and it will be automatically saved and organized in the biology digital notebook in the Evernote app and that is the most unusual feature of this product. If you paste two stickers in a single note than that note will be saved under two different tags in the digital form. Taking images of hand written notes can be done with any smartphone but organizing these notes in a particular format in software like Evernote is only possible through Moleskine Evernote Notebook. Also, once you purchase this notebook you get a coupon code along with it for 3 months free access to premium plan for advanced Evernote features. There are cool features in the premium plan like you can use your voice to write notes through audio recording system in the software and much more. Just watch this youtube video to know about 11 amazing different features of the Evernote. You can also watch this video for 5 more cool features. Not only students but many business people are making use of it as its meant for everyone and its really a cool product to gift someone. The only disadvantage is, the notes digitized from the physical notebook into the Evernote cannot be edited using the screen editor in the app. If you are writing the note in the Evernote itself than its possible to edit. There is another similar notebook called rocketbook wave which is more advanced and useful than evernote notebook. This notebook is associated with an app which can be used to scan all the pages in the notebook and then take them to any computer device including Apple iphone and ipad. The scanned pages can even be saved in a folder in any free cloud service such as google drive docs, dropbox, evernote, microsoft onenote and more. Also the scanned text and pictures can be edited. Also all the written notes can be erased using microwave and so this notebook can be re-used many number of times. There is also a USB bluetooth wireless mouse, which can be used to scan the text on any notebook, and instantly taken to the computer, and then can be saved as a word or excel or text document, and that document can even be edited to modify the text scanned through the book. 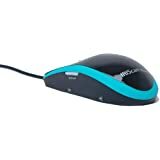 You can know about this mouse in the article A product to scan text from book and save to computer.Below is the picture of that mouse. Drag this scanner mouse on any text or picture in a book or magazine and those will come live on computer in real time. 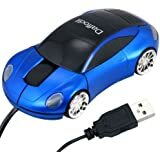 This mouse is in the shape of car which looks unusual and a good product to trick people arriving at home. Hardly anyone would know this is a mouse and not a car toy. See picture below. This Leap Motion Controller device help you control a lot of things on your computer with hand gestures.